Named as one of Ireland’s top foodie towns, the humble seaside village of Dingle, Co. Kerry, is absolutely delectable. With food festivals, incredible markets and gourmet speciality shops around every corner – this place couldn’t help but be a prime destination for everyone who enjoys a good meal. Not to mention that the freshest of seafood is the order of the day. Do yourself a favour and take a trip to The Kingdom, purely to sample a snippet of Dingle’s delicious culture. If you’re looking for the best, freshest and tastiest seafood restaurant in town – look no further than Ashes Bar and Restaurant on Main Street. A family-run business, who’ve even named their homemade lemonade after the daughter of the house, Ashes boast the most incredible fish, good company and homely surroundings. You couldn’t possibly leave this place without trying the heavenly dessert menu. Trust us – they’re worth the calories. Yep, the Wicklow Street haunt has a predecessor, and never mind Disneyland, THIS is the most wonderful place on Earth. Hail, rain or shine – a trip to Murphy’s in Dingle is as necessary as it is brilliant. So you’ve set yourself up in a nice holiday home in Dingle, and you’re keen to try your own hand at cooking, for once. How about treating yo’self to the freshest of fish, from family-run business O’Cathain Iasc Teo. They specialise in mackerel, herring, horse mackerel, sprat and tuna, while also boasting several fresh catches of the day, each and every day. Located right on The Quay, you can’t get much fresher than these guys. It’s not often that a local pub’s food will rival the best restaurants in the area – but this is what happens in Dingle. John Benny’s is a toasty pub with a stone slab floor, tremendous staff and, most importantly, no TV – making it a favourite with tourists and locals alike. The seafood chowder is the best, full stop. You will not find one better, and that’s a promise. For a more upmarket experience, the Chart House has everything you could want and more. This is a quality, unhurried and wholly brilliant dining experience that could rival absolutely anywhere, in terms of both quality and service. Reservations during the summer are a must, as the reputation of this foodie haven precedes it – but when you do get the chance, get the seafood risotto. Or mussels. Or both. Actually, definitely get both. 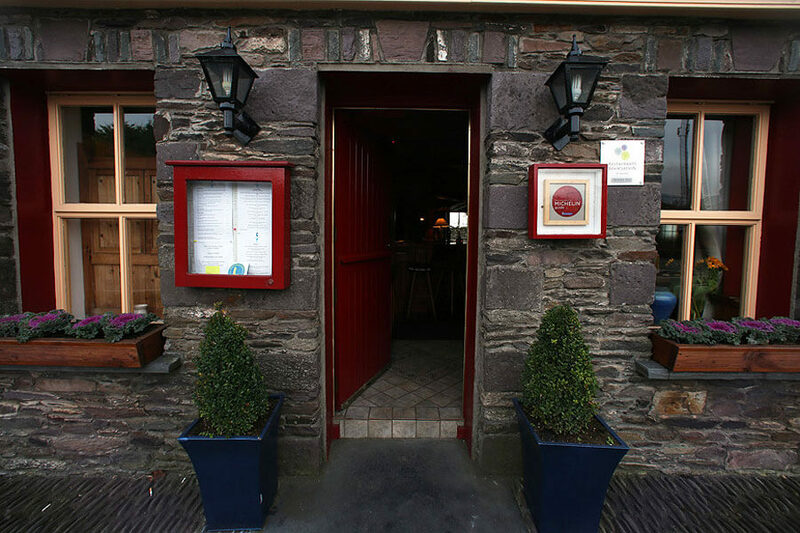 The Half Door, but whole heart – this restaurant is reasonably priced, beautifully decorated and superbly delicious. Their lobster bisque is famous throughout the land, with the baked Blasket crab au gratin coming in a close second. They do cracking early bird menus, and the wine selection is second-to-none. The bread and butter pudding is heaven on earth, too. Just sayin’. A favourite with locals, Doyle’s is a seafood restaurant with impeccable taste and cosy atmosphere. The venue itself is stone-walled, decorated with fish-themed art and their early bird offerings are a dream, with two courses for €27 and three courses for just €32. The service is also second-to-none, and the wine list will certainly leave you feeling merry.